The first thing you need to do is setup a Windows Live account and then sign up for Windows Azure Online Services. We discuss this in this post so go ahead and check it out. In our case sence we have already created a Windows Live account, it forwards us to that address. 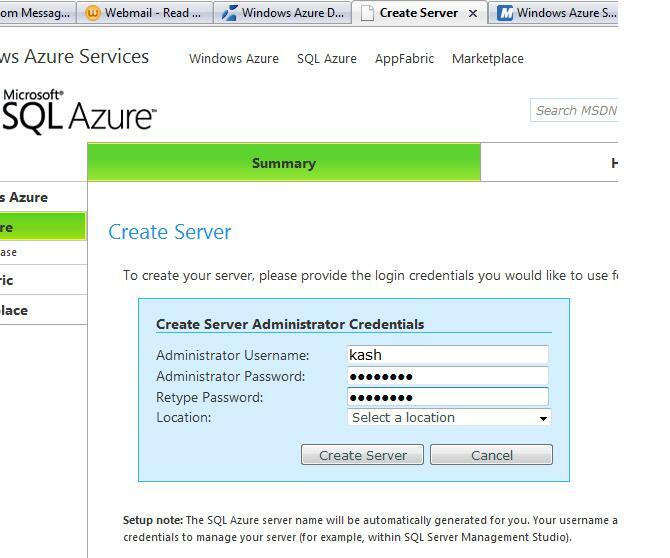 After activating your subscription, you can create your database server at the SQL Azure Developer Portal. Here is the actual link also. 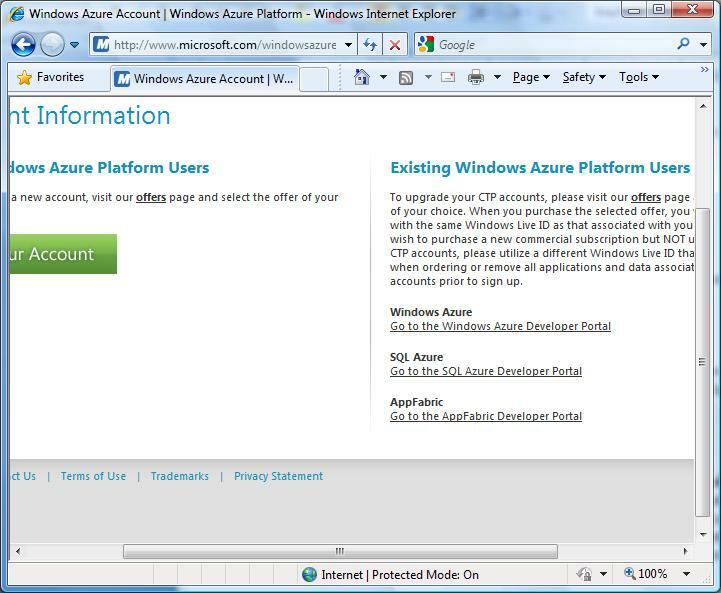 Once you sign in the Windows Azure Portal, the default project will be listed. By default, the subscription name will be used to name your project. In our case here is the screen shot for our project. Check the Status column to verify if your subscription is Enabled or not. Click I Accept. Then, you can create your logical server. Choose the location that is closest to you to avoid extra bandwidth costs and achieve better performance. Next we are going to create the SQL Azure database server. 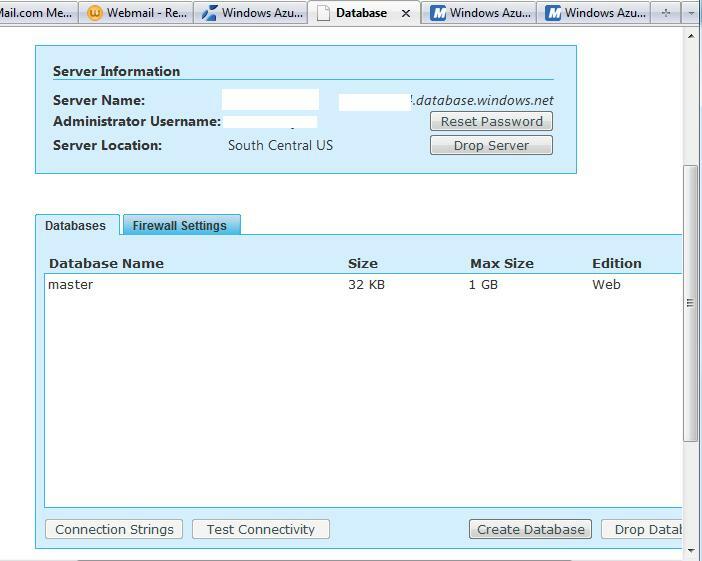 Enter Administrator Username and Password, click Create Server. Here is the information from our SQL Azure server. This step goes ahead and create the Sql Azure server and a Master system database under it. Now you should be able to see SQL Azure Server administration page. We have included one for your review. 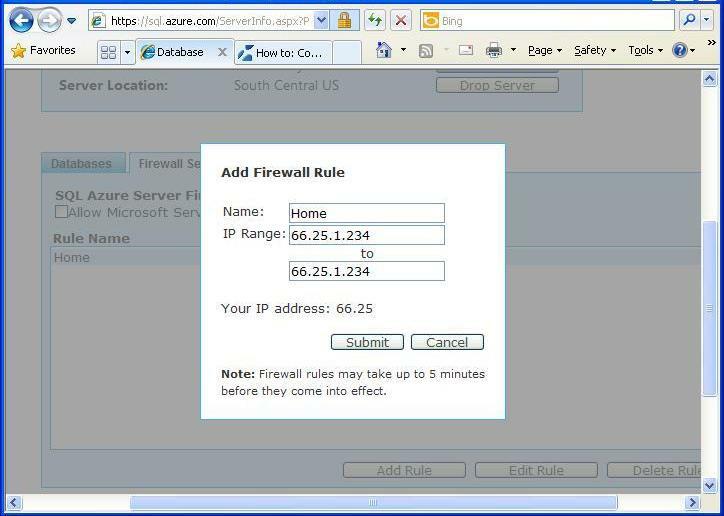 Before we create a new database in SQL Azure we are going to configure the Firewall settings. This will allow connections from the Internet within a certain range of IP addresses. Click on Firewall settings and then select Add Rule. 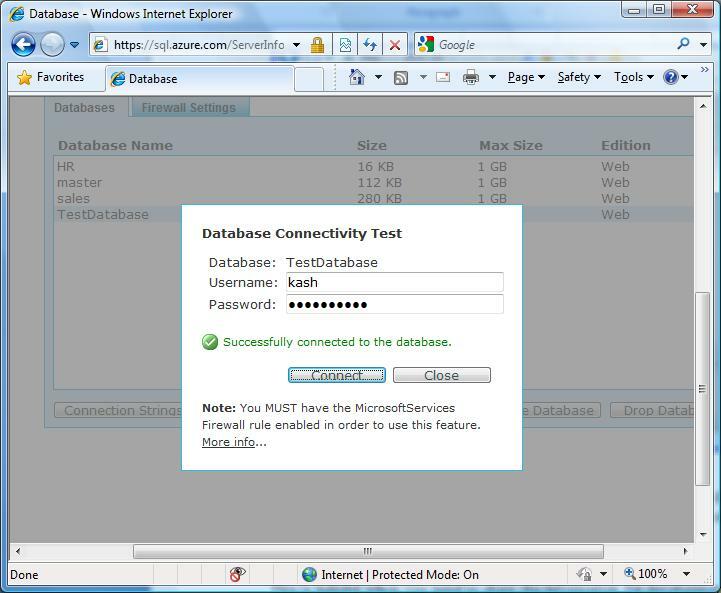 This will open up a new dialog box with information on your home IP address. Go ahead and copy the IP address to the IP range text boxes. Click Submit next. Here is a monitor display from our Server Configuration. In order to allow Microsoft Services and other applications to access your SQL Azure, you also need to check the box labeled Allow Microsoft Services. Here is the step in action. Now we are ready to create a SQL Azure database using the SQL Development portal. Click on Databases tab and select Create database. Enter a name for the database, select an edition and max size. Next click on Create to setup the database. Here is a screen demo from these steps. In order to make sure that all the settings are correct, go ahead and try to connect using the administration credentials from before. Here is a screen capture of this step. 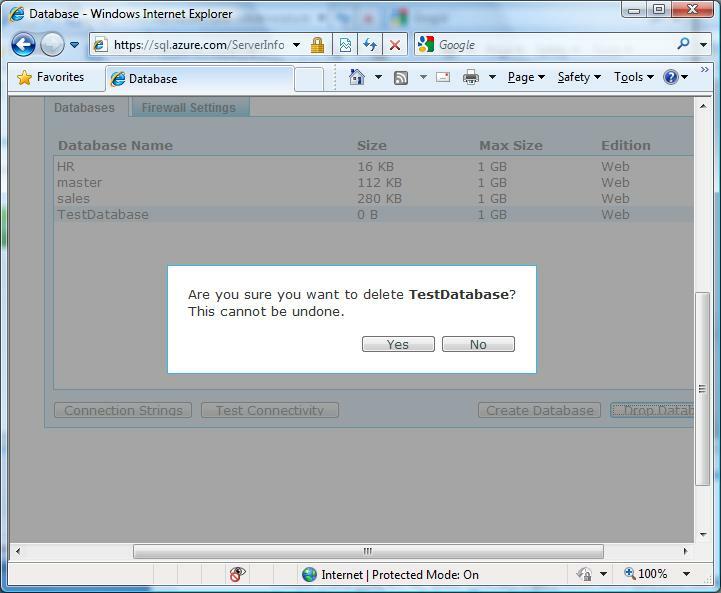 Finally when you are all done with the SQL Azure database, you can go ahead and delete the database. You can click on Drop database. The step is shown right below. 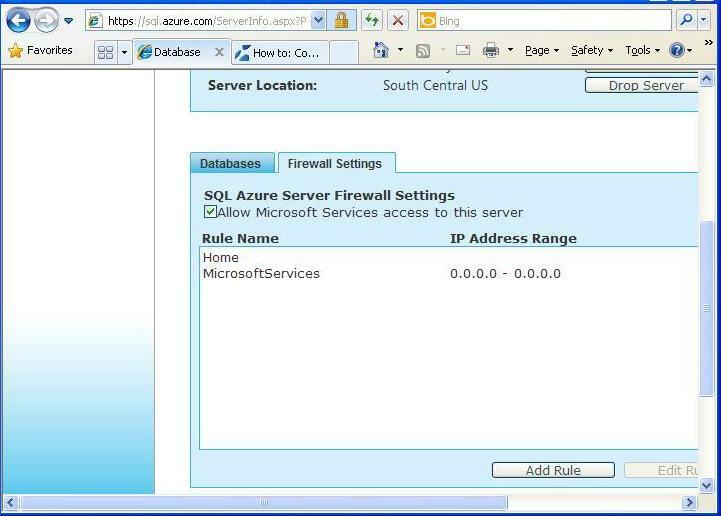 This entry was posted in Installation and tagged Create Database, Installation, Manage SQL Azure, SQL Azure. Bookmark the permalink. I am glad you liked it, we will be posting more topics as we go Live soon with the website. This is a fascinating post. Looking forward to reading more of your writing. Bertrand Russell~ Guy requirements for his happiness not only the enjoyment of this or that but hope and enterprise and alter. Bookmarked – will come back within next week to evaluate rest posts. 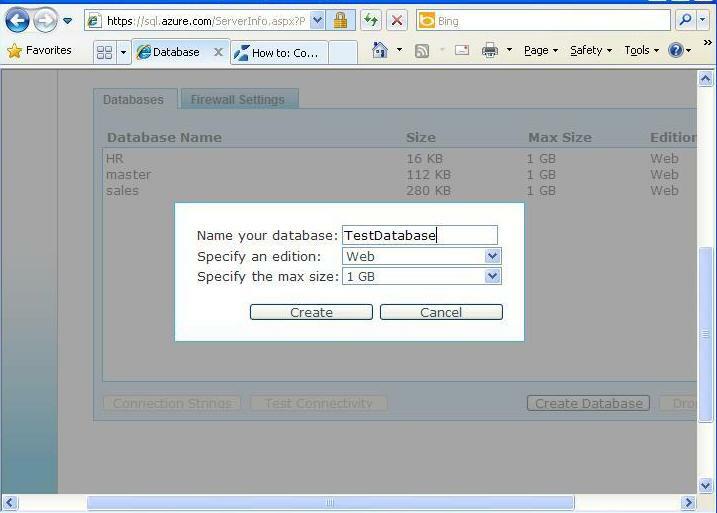 I like Your Article about How do I setup SQL Azure Server and Database | SQL Azure Tutorials – Blog Perfect just what I was searching for! . sqlazuretutorials.com is bookmarked for future reference!